Our clients can avail from us a supreme quality range of Masking Tapes, which is known for its excellent features like resistance towards chemical, weather and for their high gluing capacity. Along with durability, these tapes are also able to withstand temperature up to 60 degrees, making them perfect to work in high heat zone also. 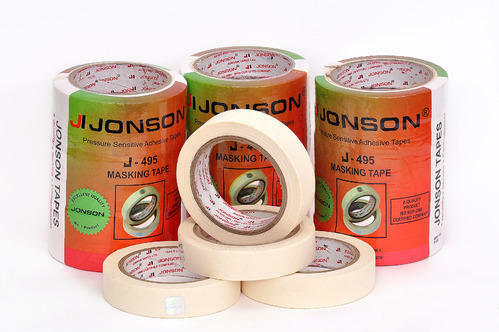 Jonson Tapes is one of the pioneers in the manufacturing, supplying and exporting of adhesive tapes, adhesive labels, self adhesive tapes and non adhesive tapes and insulation materials (cotton insulation). Incepted 5 years back, the Groups has attained insurmountable heights in our sphere of activity. Our organization is focused towards achieving maximum returns for both clients and ourselves by providing quality products at the most cost competent prices. We confirm that our clients are being served with the best in the industry.